From the moment I started designing this room, I knew it would be one of my favorites! What girl can resist a room so flirty and femine? When Alison contacted me about helping her spruce up her office/ lady cave into a chic, modern space, I knew that glam and girly was the way to go. Here are a few of my favorite elements of the room. My favorite find on this board... the gray links fabric is for a futon cover! Yes, I know. Just adorable. And relatively inexpensive from Tonic Living. Alison noted that she has a futon currently in the room and that it must stay, so I suggested that she paint the oak frame of her futon either shade (light or dark) of gray and add this new cover. Perfect addition to the room. I'm a big fan of this Eskayel wallpaper. It's so pretty! Alison could either do an entire accent wall in the paper or even just a large wall scroll hanging (like Chassity did here in her kitchen). I'm also head over heels for the quartz paperweight for Alison's desk. I've also seen these for less than $20 at HomeGoods. I always like to take into consideration what "needs" each room has, so when Alison mentioned that she'd like to have a chalkboard area in the room for her little ones, I made sure to work it into the design. Because a whole chalkboard wall isn't exactly glam, I thought she could dress it up with a beautiful white, ornate frame (or two or three!). How incredible would it look if Alison did a whole wall with chalkboard + white frames for the little ones to draw in?! Or simply set a large frame leaning up against the wall, almost like an easel. Lots of options there : ) Alison can just spray paint some Goodwill frames and either paint the walls with chalkboard paint or a surface behind the frame (plywood, glass, etc)-- a good chalkboard frame tutorial can be found here. Alison loves the design and her entire source list, which puts a big smile on my face! In fact, this is what she said: Michelle, to say that I love this mood board would be an understatement! Ahhh, I am so excited and just love everything about it!!! Thanks for being so great to work with, Alison! 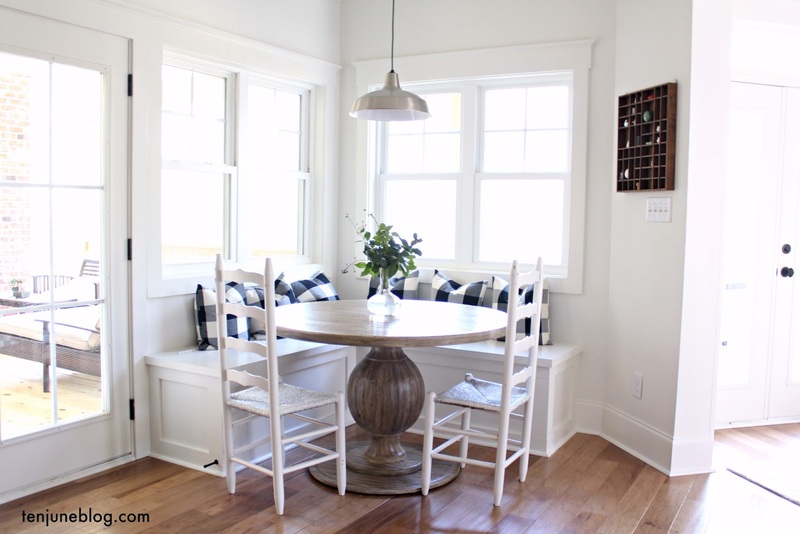 Are you looking for a design jump start for any room in (or outside!) your house? Even if you've got a few ideas going, I'd be more than happy to help you pull them together. 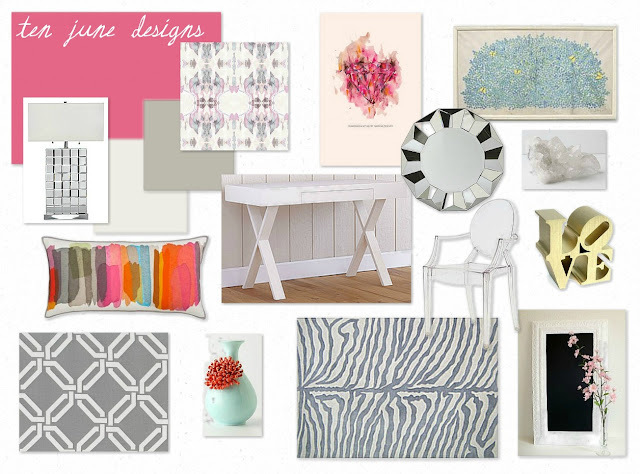 If you're interested in a personalized room design, source list, layout or any of my E-Design services, feel free to check out my E-Design page or shoot me an email at tenjuneblog@gmail.com. This is fantastic! I love the pink with the gray. And Tonic Living is such a great source. Well done. Your client must be thrilled. Oh I just majorly heart this space! So fun and feminine and I LOVE that darn desk! It's perfect! Literally, it is hard to put into words how MUCH I love what you have done. Seriously--it is adorable, rad, awesome--haha---I love it! What do I love the most? The desk, the lamp, the throw pillow, and the futon cover! Great work! Cute room! I love the lumbar pillow! By the way I linked you to a post today! I think I need a whole apartment in this color scheme for girls' weekends! Loooooove it! Seriously. Beyond amazing work, Michelle! You have mad skills girl! I love pink & gray combos! Love the desk and the chalkboard ideas!! LOVE, LOVE, LOVE this room!!!! I hope you get to share the end result. LOVE! and me want that pillow. where you buy lady? AH! I love this space. Totally me. I'd love to work everyday in this glam girly office. Love your picks, girl! I love it Michelle. What a great color combo, so sophisticated! It is like you just designed this space for me! Love the wallpaper, zebra rug, pillow- honestly there is not one thing I don't like. Get it girl, great design! Such a cute room! I love the pillow. Actually, I've seen it before but I didn't like it until now--you've used it perfectly! I love it! I want an office exactly like that for myself. Another amazing room. I love everything in it. So feminine. I love the colors. What a fabulous space...adore the colors!! I just found your blog via your guest post on Mackey Madness, and I wanted to let you know I'm a new follower! I loved all 3 things you posted, and can't seem to stop reading here on your blog! I really want that office to be mine! You did a great job! Is your office at work cute? I would love to spruce mine up a bit. Hey Michelle! I have been following your blog for the last couple of months and absolutely LOVE it! I have a question for you though...how do you do the picture thing that you have done with the images for this post? I am trying to figure it out and it's driving me crazy. Is there a program that you use? Any help would be greatly appreciated! Thanks so much! !